A collaboration of scientists from the US Department of Agriculture and the University of California Davis, among others, has introduced a precision instrument that can determine the water loss, or surface renewal, of agricultural systems that are threatened by water scarcity and climate change. "These systems provide growers with real-time data needed to make irrigation decisions," said Dr. Andrew McElrone, a US Department of Agriculture and University of California Davis researcher involved in the project, "...[It] could lead to significant water savings by facilitating more efficient use of water." According to McElrone, the data from this surface renewal measuring system allows researchers to determine how much water in soil is actually used by plants, versus how much is lost through processes like evaporation. 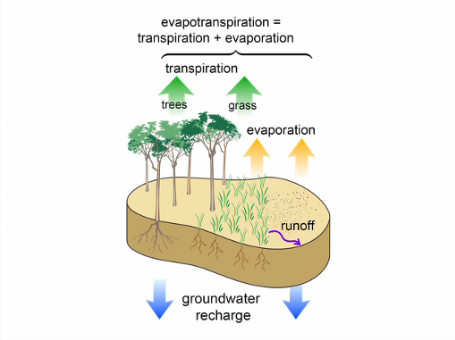 Among the numerous variables involved in the calculation process, the system measures wind temperature and speed, soil temperature fluctuation, and a process called evapotranspiration, or, water evaporation through soil and the surfaces of plants. Perhaps most importantly, McElrone and his colleagues' protocol simplifies this complex and typically expensive process—specifically, the complicated process of pairing a surface renewal measuring system with a statistical analysis method called eddy covariance—into a method that is better-prepared for implementation into the market. 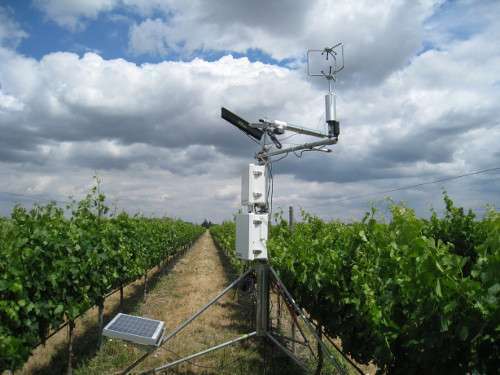 "Our recent work has eliminated the need for calibration of surface renewal against eddy covariance, and thus provides an economically viable solution for measuring actual crop water use," McElrone said. These instruments have been already been deployed in field experiments by McElrone and his colleagues and at the California Department of Water Resources. Current crops involved include wine and raisin grape vineyards, rice, alfalfa, almond, walnut, peach, lemon, avocado, and corn farms. 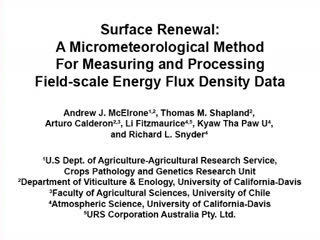 JoVE has published the article, Renewal: An Advanced Micrometeorological Method for Measuring and Processing Field-Scale Energy Flux Density Data, in its signature video-demonstration format. McElrone said that he and his colleagues made the decision to film their experiment with JoVE in order to ensure their procedures' successful adoption into the agricultural research field. "We dream that our recent advances enable the adoption of this technique across all agriculture in the western US and other similar dry land growing regions worldwide," said McElrone.